The foundation vs. foundationless argument is a hot topic in the beekeeping world right now, and it is often a source of confusion for beginning beekeepers. So what's the big deal? Let's take a look! Before the time of the removable frame, beekeepers allowed their bees to build natural comb entirely within clay or woven hive enclosures. Even Langstroth’s first hives in 1852 were equipped with empty 4-sided removable frames that honeybees could build natural comb within. As beekeeping expanded to an industrial scale, it became common for thousands of hives to operate in a single apiary. New equipment began to roll in, creating ease of management for large-scale beekeepers. One such invention is foundation. Foundation is a pressed wax or plastic frame insert with a hexagonal template for bees to build their comb on. Combs built on foundation are always straight, very stable, and are dominated by worker bee brood with little drone comb. 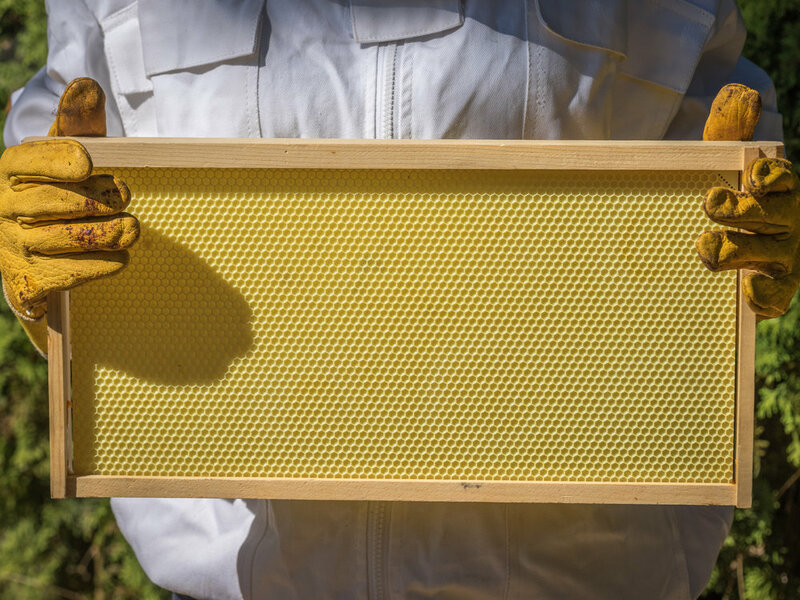 Additional maintenance benefits include the ability harvest honey from many frames at once in a centrifuge (called an extractor), and once the honey is extracted, intact combs can be replaced in the hive to be used again. A frame of plastic foundation. When allowed to build their own comb, worker bee cell size averages 4.9 mm in diameter, while conventional foundation measures 5.4 mm in diameter. In 1893, a group of scientists hypothesized that by providing bees with a foundation with larger comb cells, they would get bigger worker bees, and bigger is better. While worker bees do indeed become larger after incubation in a larger cell, bigger is not better. Larger worker bees take longer to incubate, and have shorter lifespans. This increases the interval between generations, which can decrease foraging workforce at crucial times. Additionally, foundation has uniform size across all cells. If you look at a natural comb, you’ll find patterns and clusters of cells with different sizes. Natural comb follows a “template” provided by thousands of years of evolution by natural selection which optimizes the response of the hive to their environment and seasonal needs. Generally speaking, we prefer to trust natural selection for hive management whenever possible. --And so do the bees! When frames with and without foundation are provided side by side in the same hive, bees generally begin building comb on the foundationless frame first. Bees build comb by “festooning”, or hanging from a high point to form a “bee-chain” by linking legs in the space they plan to fill. The bees at the bottom of the chain secrete wax flakes from glands on their abdomens, which get passed up the chain and molded into place by the bees at the top. In this way, honeybees build a 2-sided comb at once. Foundation in the center of the comb acts as a barrier which breaks up their normal festooning behavior. Building one comb on foundation requires two festoons on either side of the foundation, which takes them longer, and thus requires more energy than building natural comb. To encourage bees to build on foundation, it must be coated in beeswax. Foundation available for purchase is coated in wax obtained from commercial beekeepers, which is full of pesticides and remnants of treatments that you do not want to introduce into your hive right off the bat. Beeswax acts as an air filter in the hive which builds up pollutants over time. In nature, honeybees have a symbiotic relationship with wax moths, which eat old comb. The moth larvae remove old, dirty comb to free up space in the hive for the bees to build fresh comb. When reusing old comb after honey extraction, the wax does not get cycled out until the beekeeper decides to remove it. Old wax is regularly cycled out of hives with foundationless frames during honey harvest. When going foundationless, beekeepers will need to monitor comb production to ensure it is built straight on the bars or frames. This is best done early after installation. Fresh wax is white and pliable and easily molded into place with a gloved hand. In extreme “cross-combing” circumstances, combs can be cut and reattached with zip-ties, hair clips, or rubber bands. Once the bees re-attach the comb, the repairing elements can be snipped and removed. Foundationless frames should be equipped with guides to encourage straight comb. Some frames can be purchased with wedges on the top bar of the frame for the bees to festoon along, but guides can be added to any conventional frame. This could be as simple as sliding tongue depressors into the slot on the top bar of the frame, or inserting a small strip of foundation along the top. Harvesting honey from natural comb is incredibly easy. Excess honey frames (or top bars) can be pulled from the hive, brushed free of bees, and put in a bucket with a lid. Once you remove the comb a safe distance away from the hive, the comb can be cut free, crushed up and strained into a bucket. Both cheesecloth and paint strainer bags work well for this purpose. Once the honey is separated from remnants of comb, this wax can be processed and used for countless crafting projects! Another option would be to simply cut the honeycomb and consume it whole. Some have had success harvesting honey from foundationless frames using an extractor, though it must be done on a very low speed to prevent the wax from breaking apart. This is hugely unnecessary considering the large investment of a honey extractor and the fact that crush and strain is a fun and easy way to harvest from natural combs. Have kids around to help with a harvest? Get sticky with crush and strain for a grand time!